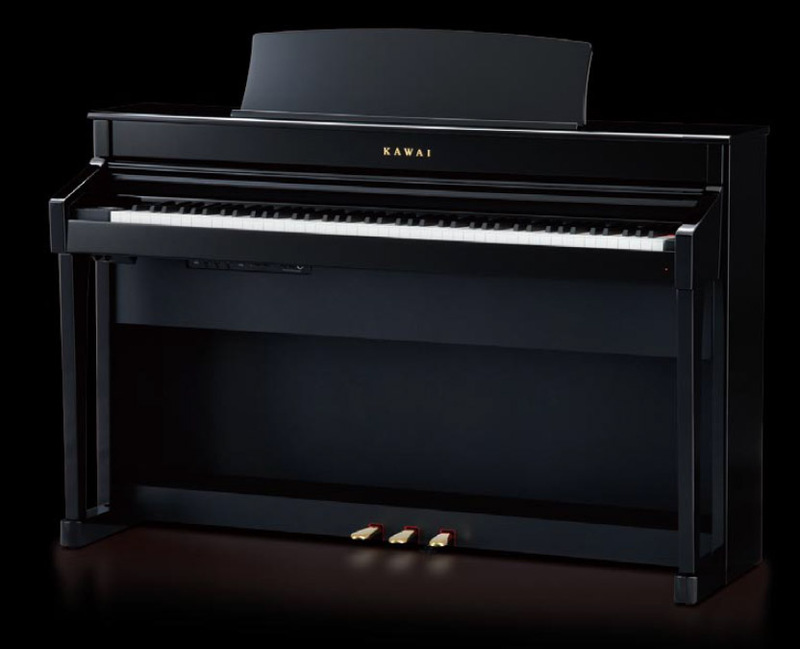 Luxurious, elegant, classic – nothing says piano quite like the refi ned beauty of polished ebony. The evocative character of a silky smooth, rich black cabinet elevates the musical instrument to that of a piece of fi ne furniture, while simultaneously raising the artistic aspirations of the performer. 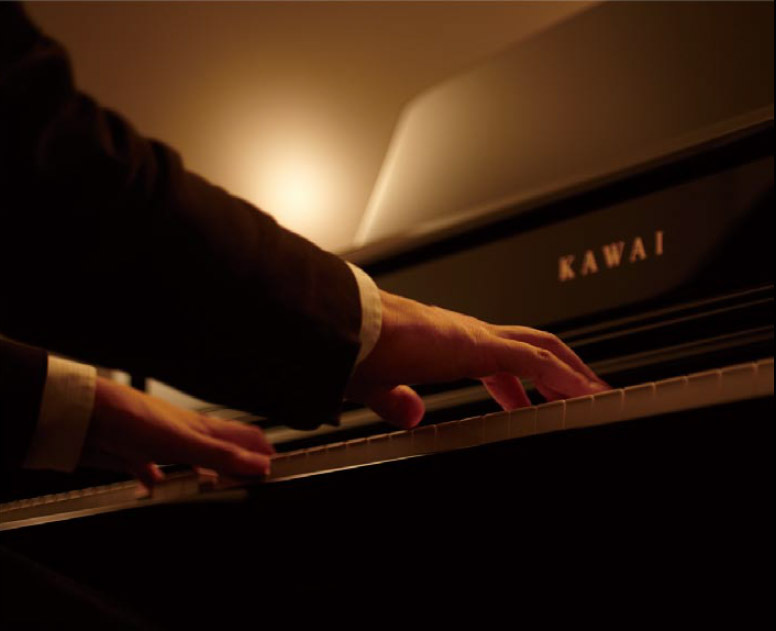 Kawai has been creating world-class musical instruments for over 80 years – maintaining traditional handcrafted processes while embracing original ideas, in a passionate quest to perfect the art of the piano. 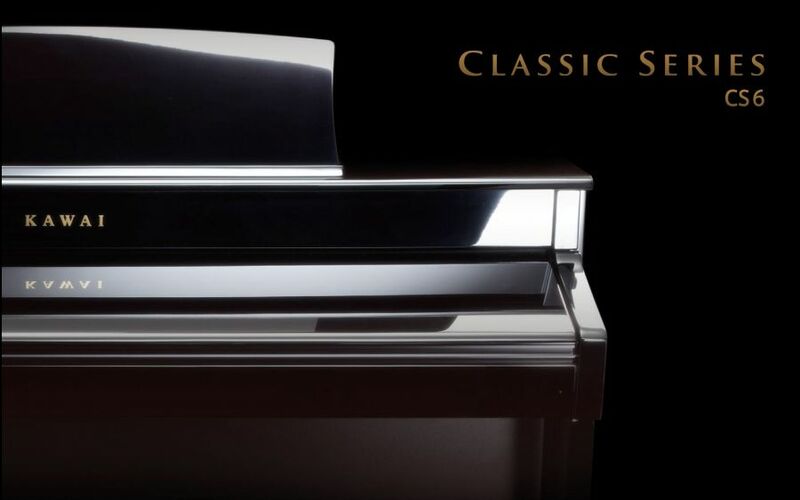 The new range of premium Kawai digital instruments pursue these very same principles, marrying together stunning polished cabinet parts (meticulously prepared in our own acoustic piano finishing facility) with modern sound and keyboard technologies. Th e result is the Classic Series – a collection of luxurious, elegant pianos that deliver a truly exceptional musical experience. Sitting down at the CS6, one quickly begins to appreciate the instrument’s acoustic piano design cues: the gorgeous rich black polished fi nish, the warm glimmer from the family name’s brushed metal lettering, and the wide music rest complete with simulated leather inlay. 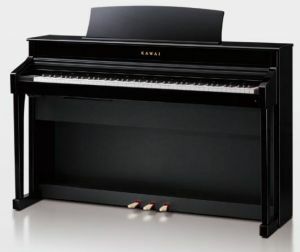 However the CS6 is far more than just a handsome addition to one’s living space, for inside this finely crafted, gleaming black cabinet lies Kawai’s advanced digital piano sound and keyboard action technology, ensuring that this exceptional instrument plays as beautifully as it looks. 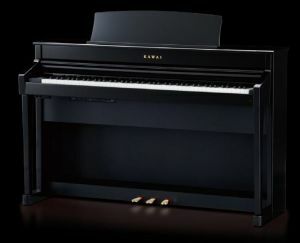 Ultra Progressive Harmonic Imaging recreates the exquisite tonal character of Kawai’s peerless EX concert grand piano with breathtaking realism, while the RM3 Grand wooden-key keyboard action with Ivory Touch key surfaces and let-off simulation guarantees a remarkably authentic piano playing experience. Complementing its beautiful appearance, stunning sound, and rewarding keyboard touch, the CS6 off ers a selection of digital piano features that further enhance one’s musical enjoyment. USB audio record/playback, Dual and Split keyboard modes, and a rich assortment of instrumental voices add greater variety to players’ performances. Furthermore, the convenient metronome function and integrated classical etudes or Alfred course books ensure that regular practise is both productive and engaging for aspiring pianists. Introducing the Classic Series of premium digital pianos from Kawai. 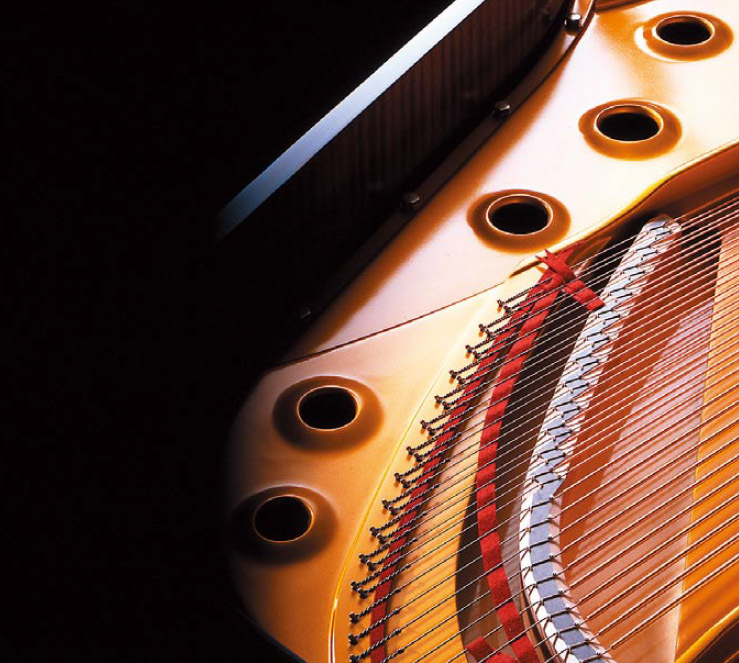 The Kawai EX concert grand piano is widely regarded by professional pianists and piano technicians as the fi nest instrument of its class. Hand-built by our distinguished Master Piano Artisans at the Shigeru Kawai Piano Research Laboratory in Ryuyo, Japan, each EX instrument undergoes a meticulous regulation and refinement process within a specially designed anechoic chamber. Following this lengthy preparation period, the completed EX piano receives a fi nal series of rigorous quality inspections, before eventually taking pride of place on the centre stage of the world’s most prestigious musical institutions and concert halls. The beautiful sound of the EX concert grand piano is at the heart of the new CS6, with all eighty-eight keys of this world-class instrument painstakingly recorded, analysed, and reproduced as high-fi delity digital waveforms. Recording each key individually in this way preserves the rich harmonic character of the original EX grand piano, and guarantees that the sound heard when playing one of the CS6’s wooden keys is a faithful representation of the acoustic source.When playing the piano, the amount of pressure applied to the keyboard affects both the volume of the sound produced, and the unique tonal character of each note. Therefore, in order to gather a realistic acoustic portrait of the EX grand piano, not only is each key recorded individually, but also captured at various diff erent strengths, ranging from gentle pianissimo to thunderous fortissimo. The new CS6 off ers a highly detailed acoustic portrait, with Ultra Progressive Harmonic Imaging sound technology ensuring smooth tonal transitions across the keyboard and throughout the dynamic range. Embracing many of the long-established principles associated with an acoustic piano, the CS6’s RM3 Grand keyboard action combines realistic materials, motion, and mechanism to recreate the exceptional touch of the finest concert grand pianos. All eighty-eight black and white keys are crafted entirely from long pieces of wood, with fi nely textured ivory-like surfaces applied to absorb moisture and assist control. 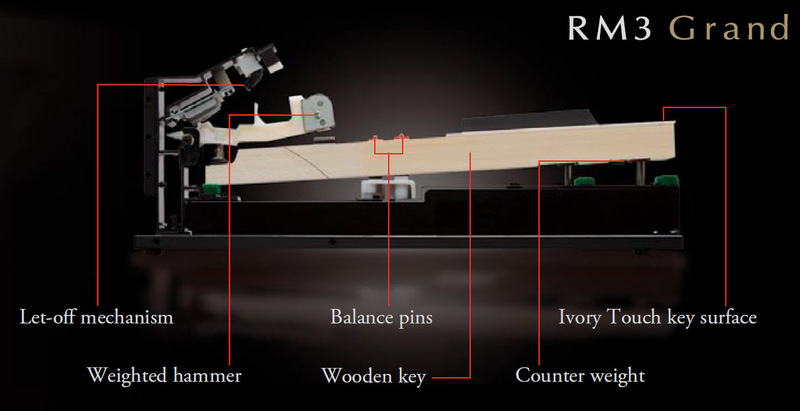 Each wooden key pivots smoothly on a central balance pin, replicating the familiar ‘seesaw’ motion of an acoustic piano action. When pressed, the back of each key triggers a grade-weighted hammer to play the note, while additional counter-weights placed at the front of the bass keys help to lighten their heavier touch during pianissimo passages. Finally, the CS6’s let-off simulation even manages to recreate the subtle ‘notch’ sensation felt when playing the keys of a grand piano very softly, satisfying the expectations of the most discerning pianists, and underlining the instrument’sunique acoustic piano pedigree. Modern USB features allow the CS6 to be connected to a computer for MIDI use, or to load and save data to USB memory devices directly. This USB to Device functionality allows songs recorded and stored in internal memory to be saved to USB for posterity, or standard MIDI files (SMF)downloaded from the internet to be conveniently played back without additional hardware. USB memory devices can also be used to play back MP3 or WAV audio files, allowing musicians to learn the chords or melody for a new piece, or to simply play along with their favourite songs. 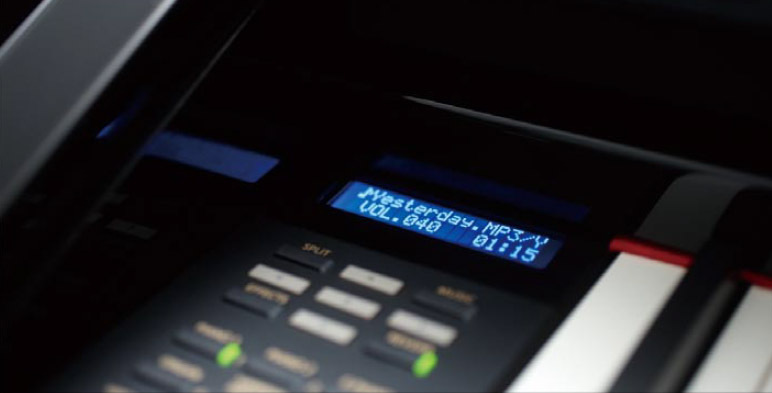 It is even possible to record performances directly as MP3 or WAV files for emailing to family and friends, or casual listening away from the piano.